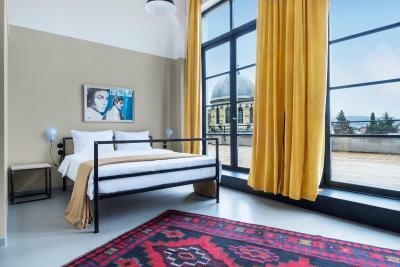 Lock in a great price for Fabrika Tbilisi – rated 9 by recent guests! Everything about Fabrika was created with art and Fabrika is surrounded by like-minded people who wanted to create more positivity. I love everything about it. Little artist inside me grew bigger. 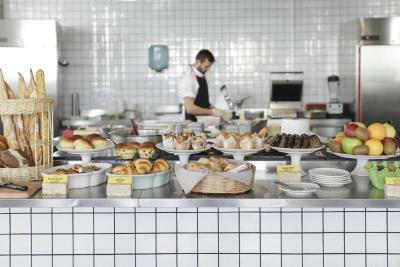 Breakfast buffet is pricey (and not included) but delicious. 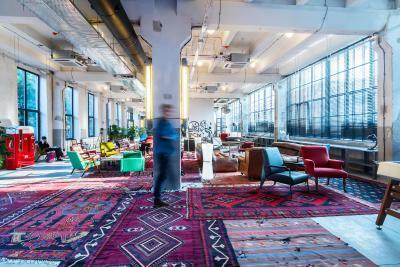 Beautiful space and great for working. Friendly helpful staff. Cool space and lots of it. Very clean, modern, functional. We stayed in a private quad -- the kids climbed up some ladder-steps to their own private space above the en suite bathroom. Good location. It has a lot of space and the windows are big. Big shower room and wc. Its clean enough. And there are many cafes, bars and restaurants near. Modern place. 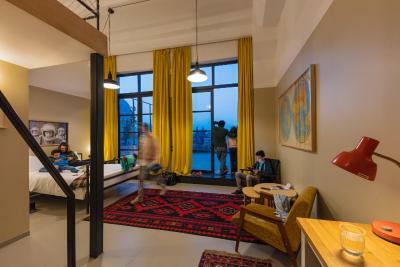 Hands down the best hostel i’ve stayed at in the world, and I’ve been to 45 countries... stayed at Fabrika both private and shared rooms on 2 different occasions. 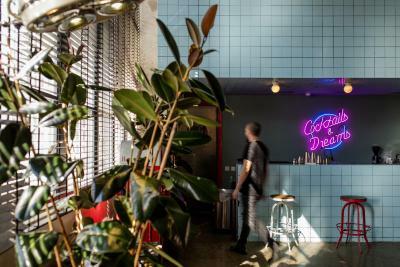 Staff is friendly, the place is impeccably clean, a very cool urban artsy vibe around the property, cool bars and eateries just 5 stars all around! 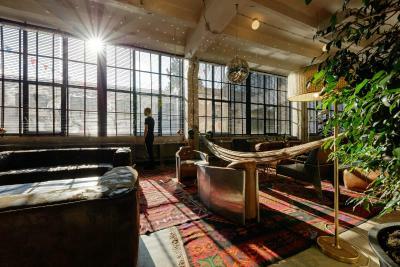 By far the best hostel I’ve ever stayed in! The whole atmosphere really made our stay in Tbilisi special :) staff were AMAZING! 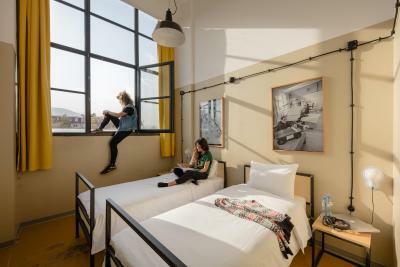 Housed in a former soviet sewing factory in the old historic part of Tbilisi, Fabrika Tbilisi features a unique design and architecture with its aged concrete walls enhanced with industrial elements. 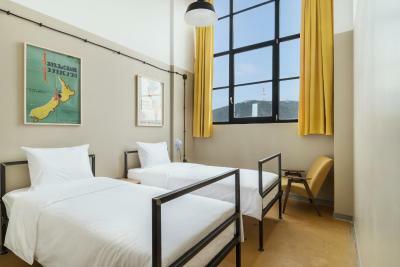 The property offers comfortable accommodations with well-decorated private or dormitory rooms, combining vintage and modern style. 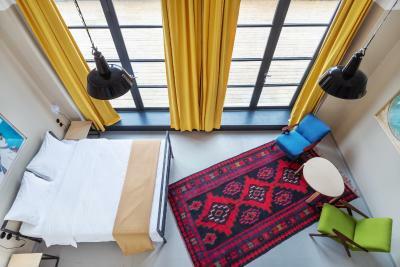 The rooms of Fabrika have the soviet half-painted walls and old linoleum floors. All rooms come with comfortable mattresses, air conditioning and free WiFi. 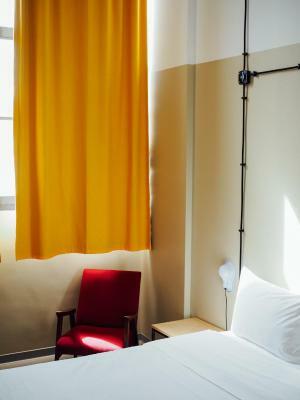 The private rooms have private bathrooms with a hairdryer and free toiletries are available upon request. Featuring a shared bathroom, the dormitory rooms are equipped with small bed counters, individual reading lamps, and individual lockers. 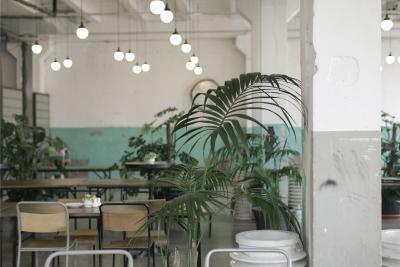 Fabrika has a courtyard with various cafés&bars, artistic studios, workshops, concept stores, co-working space, barber shop, creative education school and ever changing one-off events. The restaurant of the property offers selected dishes from European cuisine and you can enjoy drinks and snacks from the bar. Marjanishvili Metro Station is 1,950 feet from Fabrika and Marjanishvili Theater is 2,800 feet away. 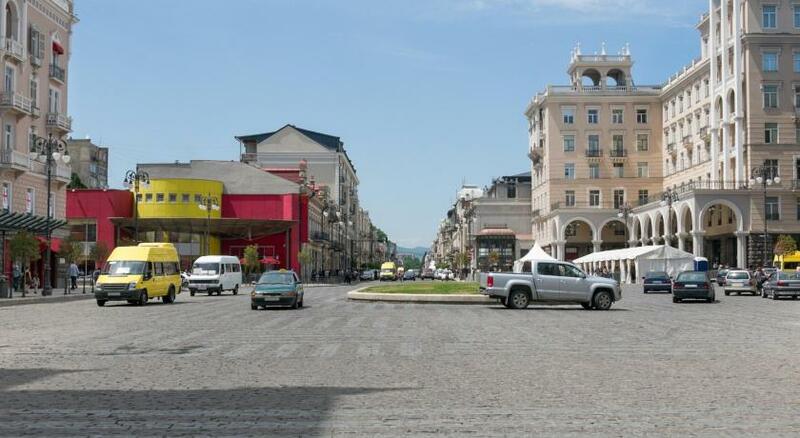 The property is 1.1 mi from Rustaveli Theater and 1.2 mi from Tbilisi Opera and Ballet Theater. Tbilisi Concert Hall and Freedom Square are both 1.4 mi away. Chugureti is a great choice for travelers interested in architecture, nature and old-town exploration. 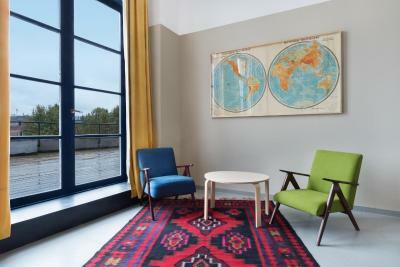 When would you like to stay at Fabrika Tbilisi? 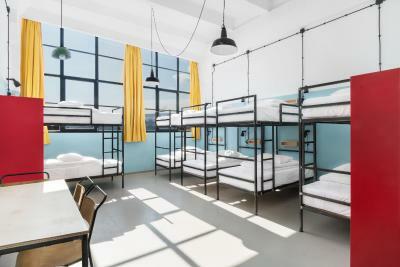 This mixed dormitory room is equipped with air conditioning, bed counters, individual reading lamps, and individual lockers. It has a shared bathroom. Free WiFi is also available. This twin room includes air conditioning and free WiFi. 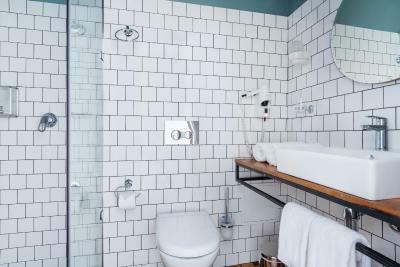 It has a private bathroom with a hairdryer and free toiletries are available upon request. This double room includes air conditioning and free WiFi. It has a private bathroom with a hairdryer and free toiletries are available upon request. 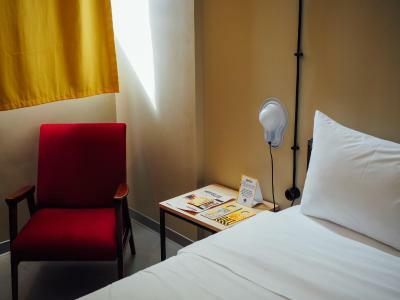 This female dormitory room is equipped with air conditioning, bed counters, individual reading lamps, and individual lockers. It has a shared bathroom. Free WiFi is also available. 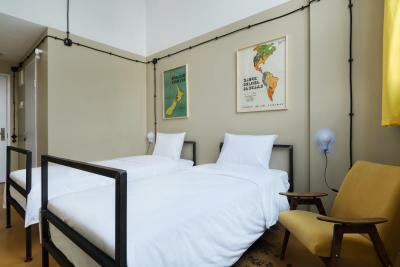 This quadruple room includes air conditioning and free WiFi. It has a private bathroom with a hairdryer and free toiletries are available upon request. This bed in dormitory features air conditioning, seating area and soundproofing. 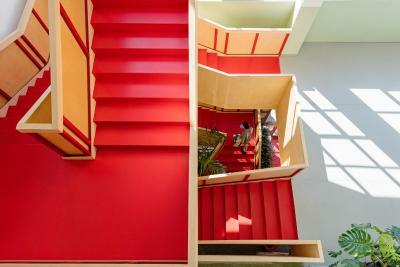 FABRIKA is a living, breathing organism built entirely on the energy and ideals of the people who inhabit it. 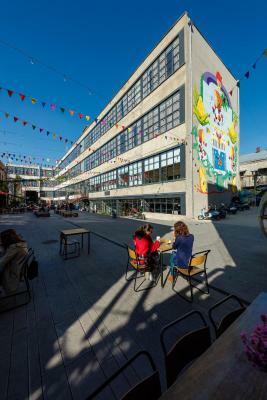 A heterogeneous mix of local tenants has been carefully chosen for the courtyard to further promote meaningful and responsible connections between the guests, the locals and the city. 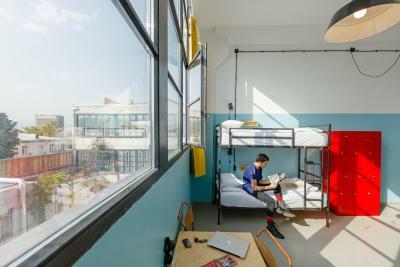 Beyond the Hostel and Suites, the complex offers a collection of artistic studios, workshops, concept stores, café-bars, co-working space, creative education school and ever changing one-off events that will generate unlimited opportunities for exploration and discovery. It is bound to become THE destination for locals, foreign travelers, and long-term residents who will look at familiar things through new perspective. 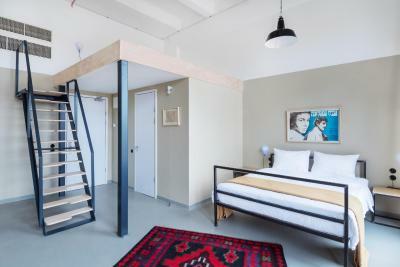 FABRIKA is where you sleep, eat, drink, design, create, interact, discover and learn. 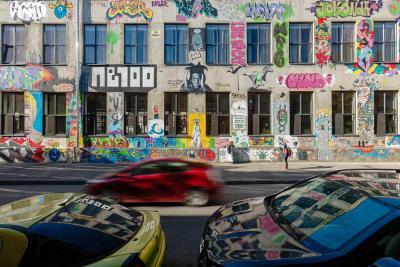 Hotel surroundings – This neighborhood is a great choice for travelers interested in architecture, nature and old-town exploration – Check location Great location - show map Guests loved walking around the neighborhood! Tone - Freshly Baked Georgian Bread Sandwiches & Georgian Wine list! Tsibakha Game Club - Sandwiches and Drinks to go with your table game! 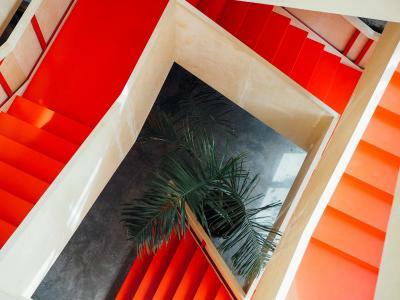 House Rules Fabrika Tbilisi takes special requests – add in the next step! Fabrika Tbilisi accepts these cards and reserves the right to temporarily hold an amount prior to arrival. One of the most picturesque neighborhoods in Tbilisi City! I think it was a bit overpriced considering the standards of the city; a bit loud at night but they provide earplugs. I liked very much the vibe and interiors, also the area is super nice and full of bars and restaurants next door. Very very clean room and bathroom, comfy bed. Such a great place ! Very trendy ! On its own, it makes one very good reason to visit this great city of Tbilissi ! 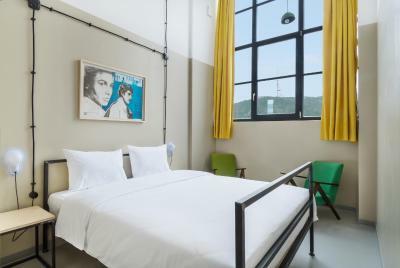 I stayed two nights at Fabrika and even though the vibe and interior is trendy, the main purpose with a hotel - sleeping - wasn’t easy to do here. Friday night it was apparently a party in the large (and cosy) back yard with loud, intense music making it impossible to sleep. They shut the music a 1am but partypeople kept it going long into the night. Apparently it was a special event–but it wasn’t announced upon booking or other ways mentioned. Thursday night was also a noisy one even without a special party going on, and both nights it was raining–I can imagine the sound level on warm evenings.... If you’re here to party, it’s a perfect place–but if you wish to experience Tbilisi in other ways without walking around as a sleepless zombie it’s unfortunately not highly recommended. Breakfast is simple and limited but fresh. I stayed in a double room which was exactly as expected for a hostel; simple standard, but clean. A bit pricey compared to hotels in the city where the standard is better but cheaper or equally priced (all though perhaps without the hip communal rooms). 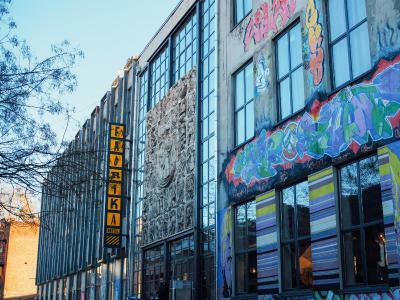 I would absolutely pay a visit to Fabrika for the place itself which is quite unique, but would put my head on a pillow elsewhere in the city. Staff was helpful and friendly. The vibe and interior is trendy, stylish and hip - an unique venue in Tbilisi. Cosy bar/lounge and backyard. breakfast was not included and its a shame for the price of the room, that is too expensive in terms of value for money. the rooms are pretty cool. Maybe a bit noisy in the weekend... but that's part of the fun! 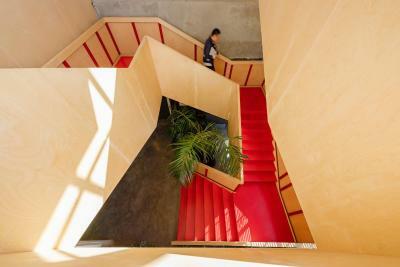 Awesome place; a vibrant and exciting hub of creativity. Stunning design and amazing atmosphere. The place is clean. The staffs are always helpful and willing. Bathroom is shared but are in cubicle as well as the toilet, so you do not have to wait and lockers are provided in the bathroom. Food at the restaurant is really good! 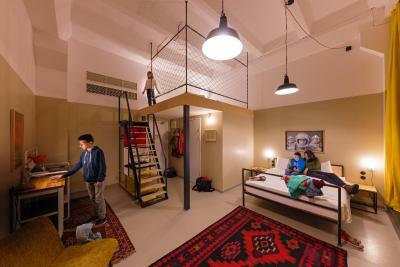 I like the concept of the hostel, it is artistic! Amazing atmosphere with a diversified outlook Great food amazing restaurants and Friday night is bonus. Great Bar and good music flanked by the your and peppy crowd of Tbilisi. It took about 25 mins to get to old town, so once we were back in the evening after a day walking, we didnt feel like going back into town in the evening. Very good breakfast, with some georgian specialities to try. The lounge area was nice to sit in the evenings and have a drink and snacks. We organised a day trip to the mountains through the reception desk, which was excellent. 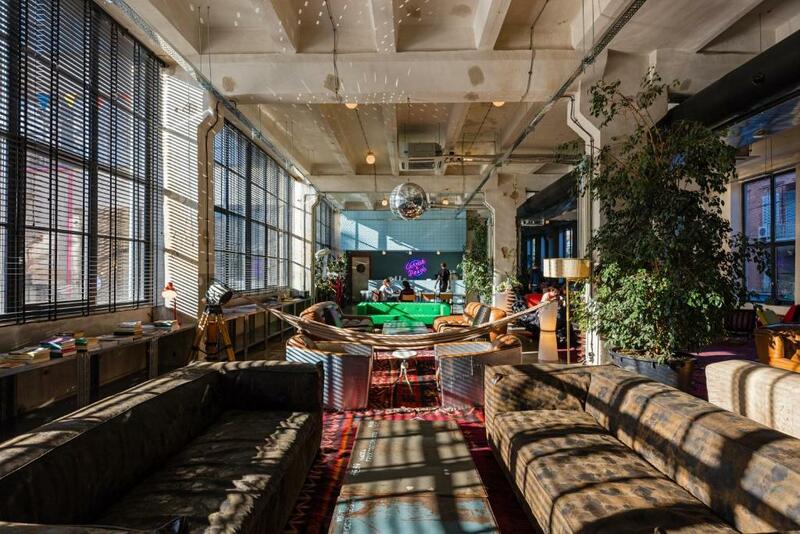 This place oozes STYLE. The atmosphere is just lovely - a healthy mix of locals and foreigners who are engaged in all sorts of things, from work to just hanging out and having drinks - you can definitely make friends here! 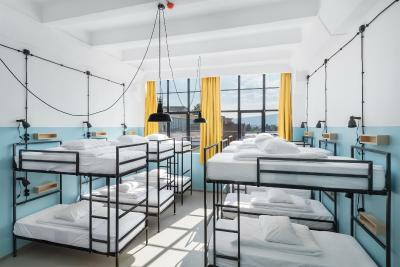 The hostel is a refurbished Soviet sewing factory that pays tribute to its past by preserving the original structure and design of the building. Outside you'll find several awesome cafes, bars and specialty shops, which are all full of young people. I booked a separate room ("apartment"), which was less comfortable than a normal hotel room, but very spacious and clean.